In her book The Liar’s Club, Mary Kerr tells the true story of a married couple who had a major argument over how much the wife had spent on sugar. Instead of resolving the simple dispute, both husband and wife held on to their grudge and refused to speak to each other for forty years. As if silence wasn’t enough to perpetuate their dispute, one day the husband took a saw and literally cut their frame house in half. They lived the rest of their lives in separate sides of the house. Granted, this story is rather extreme, but it does illustrate the damaging effects of unforgiveness. In years of counseling, I’ve never known a couple to cut their house in two, but I have seen couples who were emotionally separated from each other, often for decades, because of unresolved offenses. Forgiving others brings freedom in three areas. 1. The one who has been offended is set free from harmful emotions. When offended, our natural response is to become angry, and initially, there’s nothing wrong with that; anger is an instinctual and appropriate response to hurt. But unresolved anger can soon escalate to bitterness, hatred, and other toxic emotions. Notice who is adversely affected by these dangerous emotions—the offended, not the offender. When we refuse to forgive others, it is often we who suffer the most. So we must forgive for our own well-being. This is why we must forgive even if our offender doesn’t ask for forgiveness. Our offender may never ask forgiveness so we must choose to forgive, otherwise we will suffer twice: once at the offense and then on a continual basis if we harbor anger or hurt. 2. Relationships can be healed. In the early years of our marriage, Mary and I argued often, and sometimes the squabble would become so complex we’d even forget what the initial issue was. In the heat of an argument, we would drag in issues from the past, present, and even the future. We returned insult for insult. We’d dig in our heels, choose our weapons carefully, and engage in mental and emotional battle. But as we’ve matured we handle disputes differently. We still argue, but it seldom gets out of hand. Moments into the conflict we may say something like, “Sweetheart, I love you. Regardless of what happened to cause this dispute, our relationship is more important. Please forgive me for my part in this misunderstanding.” Are we naively ignoring the issues? No, we’re simply maintaining the integrity of our relationship. Forgiveness is life-giving water poured upon a parched, dry relationship. Without it, relationships can spiral out of control until they are broken or impaired. 3. Forgiveness offers grace to the offender. When we forgive others we offer them grace and emotional release from feelings of guilt. It’s important to know that forgiveness is a choice; it’s a function of our wills, not our emotions. We must choose to forgive because we will seldom feel like forgiving. I often illustrate this by holding a pen in my hand and then, as an act of my will, I drop the pen on the floor. Forgiveness is like that; we must drop the issue and the offense. Just let it go. Forgiving an offense doesn’t mean we will forget what happened. It may be hard if not impossible to forget the details and memories surrounding an offense. But forgiveness will provide emotional relief, and in time it will ameliorate painful memories. Don, thank you so much for posting this very important article. Some of the best advice I’ve ever received regarding the marriage relationship is, “Be quick to forgive, and be quick to ask forgiveness.” When I follow this advice I have much more peace in my life. When I don’t follow it, I create strife for myself and regret that I haven’t followed it. To me, forgiveness is my giving in to my internal battle for selfishness. When I forgive, no battle ensues. When I fail to forgive, I focus on myself instead of what God wants me to do and my witness for Him is compromised. To forgive not only shows grace to the offender, as your article points out, but it provides freedom from strife for the forgiver. 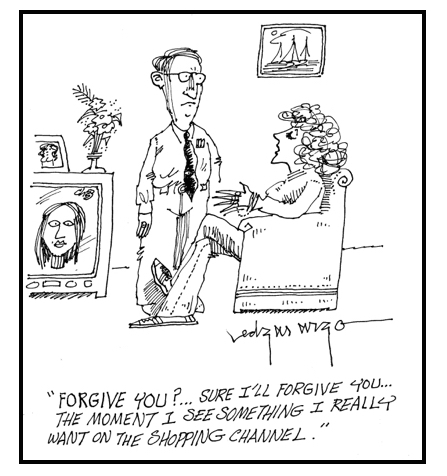 What are your thoughts about how our forgiveness of the offender relates to their repentance? A few years ago, I forgave both the man who raped me and the French students who went past the alley way. Both actions freedom me in an amazing way.